It would be so good for him, he'd lose some blubber too! If the minimum wage was a living wage, not only would he not be constantly hearing about it, but there would be a lot less need for food stamps, welfare, etc. Also, more purchasing power means that minimum wage earners would be contributing more to the economy. Noted and Absolutely signed, thanks. I've said it a hundred times, and I say it again; -$15 an hour - for a start...NOW! Signed and noted. I don't think he could do it. 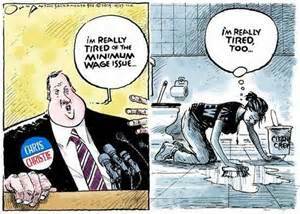 I wonder what Christy would buy to eat on a minimum wage salary? Have signed previously, also think Scott Walker ought to try it. I am so embarrassed to live in a state that could re-elect this putz, but then he bullied, and terrorized the Dems here, the party all but abandoned his opposition. This is also the state that elected Christine "The air at Ground Zero is just fine to breathe" twice. He's really a piece of work !!! What is wrong with people that don't know a phony when they see one? The evil side of capitalism. Signed of course. Noted and signed: "Your size suggests you've never had to experience the minimum wage..."
Signed. I hope the people of New Jersey learned their lesson about trusting him. Noted an Signed. Take Care.